The Mad Toto X-Large Tube Case covers your glass, glasses, pipe, or even your harmonica! 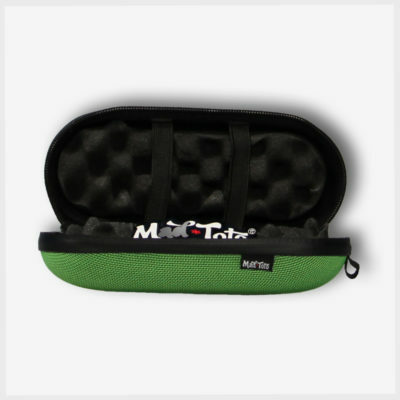 Each Tube Case consists of a tough fiber shell, wrapped in rugged nylon fabric, sealed together with a waterproof zipper with a custom Mad Toto pull. Protect your piece from eminent disaster with a Toto Tube glass pipe case. Inside, you will find heavy duty padding on the top and bottom, with dual elastic straps to keep your most coveted items secure when opening. The Mad Toto X-Large Tube Case measures 7 inches long, with a diameter of 3 inches.